Recently, I rode to celebrate the birthday of Sonny Barger, famed outlaw biker, founder of Hell’s Angels Motorcycle Club (the inspiration for the F/X hit show “Sons of Anarchy”) and Cave Creek area resident. It was a blast. 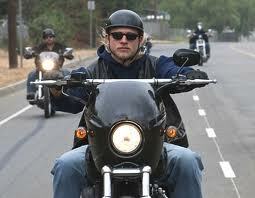 Those guys ride really, really fast, which brought to mind the opening scene from Season 5 of Sons of Anarchy. Jax (v/o): Something happens at around 92 miles an hour – thunder-headers drown out all sound, engine vibrations travels at a heart’s rate, field of vision funnels into the immediate and suddenly you’re not on the road, you’re in it. A part of it. Traffic, scenery, cops – just cardboard cutouts blowing over as you past. Sometimes I forget the rush of that. That’s why I love these long runs. Sorry to disagree, Jax, but after the ride yesterday, I have to rewrite. Kevin (v/o): Something happens at around 92 miles an hour – thunder-headers drown out all sound, engine vibrations travels at a heart’s rate, field of vision funnels to where you can only see the bike 8 feet away to your left/forward diagonal and the bike about 12 feet ahead of you. You watch that bouncing piece of white along the side of the interstate, wondering if it’s a discarded styrofoam cup or a rock that’s going to bounce up and smack you in the face (good choice going with the 3/4 helmet with clear faceguard today). You glance down at the big silver speedometer and see it pass 90, and then the mirror, hoping for a gap that will let you slow to something more civilized like…80…No luck, and just as you say to yourself “wow, this is the dumbest thing I’ve ever gotten myself involved in,” a road captain flies past you on the left, hanging on to his mini ape-hangers, feet on the highway pegs of his Harley, no-helmet, long white-grey hair almost touching the top rocker of his Hells Angels colors like you’re standing still. All of a sudden you realize, you are John Travolta’s character in “Wild Hogs” and instead of accidentally burning down Ray Liotta’s MC’s clubhouse, you’re in the pack, riding with them and you decide not to wear the yellow and black Harley Davidson skull cap at the next stop, because it looks too clean, too new, like you just bought it the day before.